It can’t be reiterated enough how children learn and develop in so many ways through even the most simple of situations. There’s a multitude of potential learning opportunities when you’re out and about with your child, so here are some ideas to whet your appetite. A trip to the supermarket to do your weekly shop may seem like a mundane part of your routine to you, but for a child, it can be an exciting adventure and a hotbed of learning. Children get to witness the social interaction and routines involved in shopping at the supermarket, such as how you interact with staff, what happens at the checkout and how you select items off the shelf. 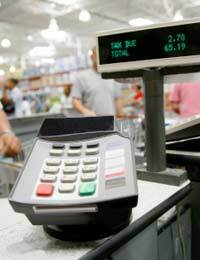 They pick up the basics of paying for items, get to see money being exchanged or how credit cards are used. They also get to see the variety of items available to buy and can learn about what all of these are. The fresh fruit and vegetables isles are a good place to start encouraging learning, especially with simple items, such as identifying apples, bananas or oranges. If you’ve got time, then encourage your child to point out (if sitting in the trolley) or pick out (if walking alongside you) particular fruits or vegetables that you’re buying. All forms of public transport, be it a bus, train, tram, ferry or plane, can be fantastic learning opportunities for young children (and older ones, too!). Their first experience of going on a train or bus can have a lasting impression and be a talking point for many days to come. When travelling on public transport, children get to experience what’s involved in buying a ticket, finding the right bus, train or plane to get onto, what happens at each stop along the way as people get on and off and the role of conductors on trains. All of these elements are important knowledge builders as far how things work and help build up a picture in child’s minds of everything involved in a successful journey. In addition to the practical details, there’s the experience of interacting with other people whilst travelling – or not, as often seems the case these days – and of getting to experience sharing travel with others. As you go out and about with your child, don’t forget that every day and every new experience could provide your child with an important piece of their knowledge development. Looking at in this way can help put a different perspective on things and help you find even more chances for your child to learn new things. You can help your child’s early learning experience by explaining things to them that they might not understand, answering any streams of questions about why, what or how things are done, pointing out things that they may miss (especially if not at child level) and generally enriching their daily life with new facts and information. Being out and about is a wonderful way of learning for children, so embrace it with enthusiasm!